JungleWatch: GUAMBOY EXPOSES HIMSELF - WE KNOW. WE ALL KNOW. GUAMBOY EXPOSES HIMSELF - WE KNOW. WE ALL KNOW. 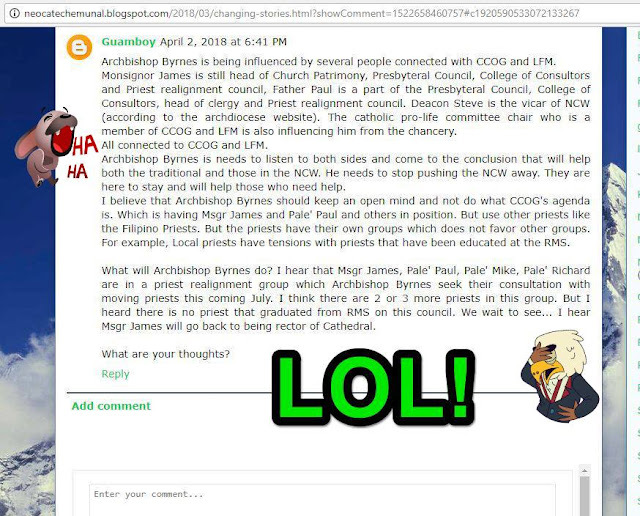 Guamboy tells us who he is by his fetish for trying to destroy Msgr. James. But beyond that, the belief that the priests named have anything to do with the CCOG or LFM is laughable. In fact, it has been very public that the CCOG has targeted some of the actions by Fr. Mike in its investigation of Kamalen Karidat.